Women became leaders in a range of social and political movements from 1890 through 1920, known as the Progressive Era. Prominent suffragists led progressive causes. Jane Addams established Chicago’s Hull-House, and Ida B. Wells led a campaign against the lynching of African Americans. 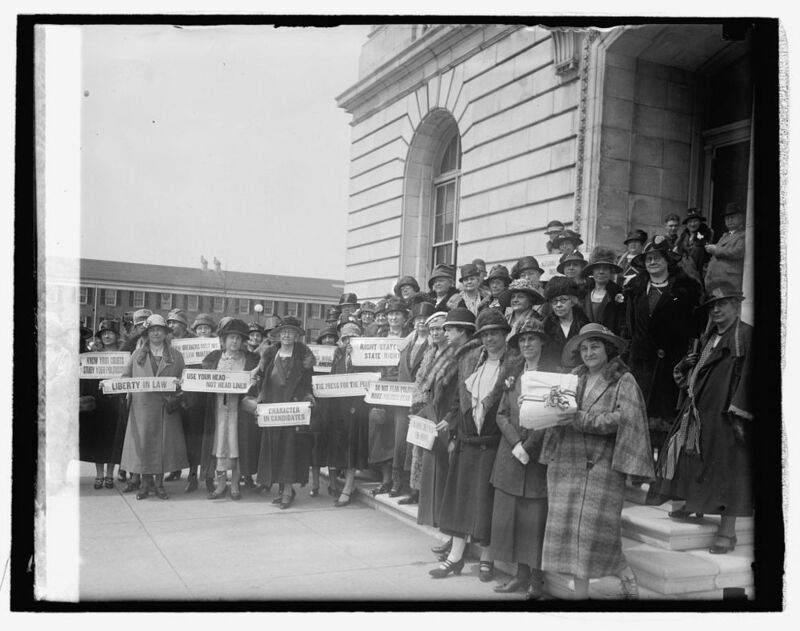 Women from New Jersey at the Capitol during a prohibition hearing, Library of Congress. In the late nineteenth and early twentieth centuries, women joined national organizations in great numbers. The rise of the National American Woman Suffrage Association, National Association Opposed to Woman Suffrage, and National Association of Colored Women grew as part of this trend. Women of all backgrounds—rich and poor, white and black, native-born Americans and immigrants—participated in these national women’s clubs. The Woman’s Christian Temperance Movement, which aimed to make alcohol illegal, was among the most popular national women’s organizations of the period. Their movement succeeded with the start of the nationwide prohibition of alcohol in 1919. Women became leaders in a range of social and political movements from 1890 through 1920. This period is known as the Progressive Era. Progressive reformers wanted to end political corruption, improve the lives of individuals, and increase government intervention to protect citizens. What did the increased involvement in reform organizations do for suffrage? What was the relationship of the Woman's Christian Temperance Union (WCTU) to the suffrage movement? What were the issues that reform movements formed to address? How were they defined as "women's" issues? Jane Addams dedicated her life to improving the living and working conditions of immigrants, especially those living in poverty in large cities. She believed through voting women could help pass laws that would improve conditions. In her speech, “The Modern City and the Municipal Franchise for Women,” Addams focused on the need of cities to clean up through “civic housekeeping.” This speech, delivered at the National American Woman Suffrage Association Convention in 1906, encouraged women to become more active in civil life in order to bring about change in human-welfare. Ida B. Wells fought hard to shed light on the racism that still existed in the country after abolition. While living in Memphis, Tennessee, Wells wrote many essays on the terrible treatment of freed African Americans. This editorial focused on the lynching of three men that occurred in Memphis in 1892, after which Wells was told not to come back to Memphis because her life was in danger. Since Wells could not return home, she wrote about the events leading up to the lynching. In this collection of writings, Wells also wrote on the different treatment of individuals based on their race.